Something a little different for this inspiration post. Less text, more pictures! But there was a time when Elephants visited Lancaster too (most recently there’s the mechanical elephant returned to Halton Mill…), we have our horse related tales (with horseshoe)…..Lancaster has had it’s share of real beasts! There are a lot of pigeons in Lancaster, and really they aren’t that different from this London fella. There are a range of pigeon knitting/crocheting patterns out there as well – you could try Bill , make a flock of small pigeons or a baby (squab!) pigeon. Knit the city have even done a youtube guide to knitting a pigeon! Some inspiration from the exhibition itself, there’s an awesome lion made out of hands (my picture really doesn’t do it justice), a pigeon made out of car parts and some cool graffitti art! If you aren’t inspired by the folklore, be inspired by the beasts around you in Lancaster City Centre! Categories: fantastic lancaster beasts | Tags: Beasts of London, fantastic lancaster beasts | Permalink. Black dogs, appearing after dark on lonely lanes were said to be death omens. Described as large, shaggy, with big feet, drooping ears and big eyes, the Lancashire names for these beasts are Skriker and Trash. Skriker meant ‘Shrieker’ a reference to the fact that the dog was said to utter piercing screams even when invisible, while Trash refers to the noise made by their paws in puddles and mud. Bowker’s 1883 book has the most fully formed account, relating to Chipping. A man called Adam headed to his home one night, and just as he was about to reach the stream he believed to mark safety he head a sepulchral howl. In the middle of the bridge stood a large black dog with eyes like the fire. The Striker glided backwards, gaze fixed on Adam, who followed hyponitised by those eyes until he stumbled. It vanished, only to reappear at the next bridge, and then outside his house. He struck out at the beast, but his stick passed through it. Some days later his eldest child died, followed by his wife. Trash was said to live on the grounds of Burnley’s St Peter’s Church (also said to have been home to some ghostly pigs). He was seen but never caught as he would vanish. A sighting of the dog was said to signal the death of someone you knew. The closer to you the dog appeared, the closer to you the person who died would be. Not a black dog, but a canine all the same, it is said that the last wolf was slain at Humphrey Head near Grange over Sands (formally in Lancashire). In the fifteenth century, Sir John Harrington was said to have finally caught the wolf after a long chase, winning his father’s love and the hand of his desired wife. The weathervane at nearby Cartmel priory depicts a wolf’s head in commemoration of this tale. Other tales include a headless black dog that was said to appear when Preston was in danger, and the black dog banished to the Wyre from Singleton only to reappear if the river dries up. Sources – The Lore of the Land – Westfield & Simpson and the Paranormal Database. Categories: fantastic lancaster beasts | Tags: fantastic lancaster beasts | Permalink. There are some popular Lancashire folk tales that are connected to buildings. Generally they are used to explain some feature of the building, or a feature close by. To the east of Kirkby Lonsdale there is a bridge known as Devil’s Bridge. At the apex of the bridge there is a deep impression in the stone said to be the Devil’s handprint. The story is, once a woman asked the devil to build a bridge over the Lune (either as she needed to retrieve a cow that refused to cross back, or so she could get to the road…). In exchange the devil asked for the soul of the first living thing to cross the new bridge. When the bridge was complete the woman threw a piece of bread across and one of her animals crossed (normally her dog, sometimes a chicken). The Devil robbed of her soul howled in anger and disappeared (in some versions he throws stones, which either landed beneath the bridge or some distance away). There is a Horseshoe that can be spotted imbedded in the pavement on the corner of Market Street and Penny Street in Lancaster. It is said that this horseshoe was shed from John O’Gaunt’s horse during his brief visit to Lancaster. It is said that many buildings in Lancashire were not built were first intended. Mysterious Forces moved the building materials during the night to another site. One such building is Leyland Church, and it’s intruder was the strangest (well, the pigs rumoured to have been involved at Winwick and at Burnley are a close second). The intended site for the church was Whittle-le-Woods,and building started in the woods. One day a farmer came to the priests and asked why they were building on his best cornfield in Leyland. Following the farmer to his field they discovered that the foundations had been moved. They moved the materials back, but come morning they had been moved again. Rhey returned the stones to Whittle-le-woods and set a guard. The guard fell asleep only to be woken by the sound of a great beast. They beheld a giant cat, with fearsome paws, moving the foundations. Unwilling to fight such a creature, they built the church at the site in Leyland. Do you know of any building with strange tales attached to them? Categories: fantastic lancaster beasts, theme | Tags: fantastic lancaster beasts | Permalink. When people hear the word ‘Folklore’ they typically think of fairy stories, though fairies probably feature the less in folklore than the many other beasts. That said Lancashire, like most of the British Isles, has its fair share of Fairy stories…..
A story sent to Notes and Queries in Feb 1853 and reported a little differently by Bowker in 1883, tells of the poaching of fairies near Pendle. Two poachers placed sacks over what appeared to be rabbit holes but were in reality fairies houses. Not knowing that their sacks were filled with fairies the two set off for home only to hear a fairy call out, and a fairy from the sacks reply. Robert Parker of Extwistle Hall, just south of Briercliffe, died following an accident in March 1717. Tradition has it that just before his death he witnessed a fairy funeral procession on the road near his home. When he looked at the name plate on the coffin, it was his own. He wasn’t alone in this, another man near Penwortham was said to have seen a similiar Fairy funeral procession mourning a fairy who looked just like him……. There is a tale which speaks of a woman from Preston travelling to Blackpool and the Fairies’ Well to draw some water in the hope of healing her daughter who was going blind. A little green man gave an ointment while she was filling her bottle, telling her it would heal her daughter. Not trusting the fairy, she tried it on herself first, and with no ill effects felt, used it to cure her daughter. Unfortunately, when she later saw the fairy at the market, he asked if she could see him out of one or both eyes. She replied only one and he blinded her in the eye she had used the ointment on. I can’t talk about the Fair Folk in Lancashire without mentioning the Trawden Forest Fairies group. Inspired by more modern tales told to their founder, they crafted and fitted Fairy Doors across Wycoller and Trawden Forest. Categories: fantastic lancaster beasts, theme | Tags: fairies, fantastic lancaster beasts | Permalink. Two prehistoric beasts have links to Lancaster via one Lancaster born man: Richard Owen. The street on which Richard Owen was born no longer exists, but it was close to Dalton Square. Owen is one of the selection of scientists featured on the Queen Victoria monument and there is an information board not far away, if a little hidden, that tells visitors a little about the man. These are the most obvious beasts linked to Richard Owen….because he named them! He first used the name ‘Dinosauria’ in 1842 and defined them into three groups: carnivorous, herbivorous and armoured. He recognised a connection between fossils that had previously gone unnoticed, creating a new group which became what we now know as dinosaurs. Owen also once ate a meal inside a giant replica dinosaur, it must have been an interesting event! Less famous than the Dinosaurs, but just as awesome to those who see any of these fossils, is the Irish Elk. A picture of an Irish Elk skull appears on the front page of one of Richard Owen’s book, and the skull on display in Lancaster City Museum was identified by Owen. These giant deer were called Megaceros giganteus by Owen, but their accepted latin name is in fact Megaloceros giganteus. The last known Irish Elk from the UK was also found in Lancashire. Horace as he is known is now on display in the Harris Museum in Preston but he was found on the outskirts of Blackpool. Adding some patterns to this, because who doesn’t love a moose or a dinosaur? The colour white often has a different meaning in folklore than it does now. White animals are often sinister, potents of doom or connected to witches in some way. There are quite a range of white beasts in Lancashire Folklore! Said to have lived in the time of the Pendle Witches, Lady Sybil,the last owner of now long lost Bernshaw Tower, was wooed by Lord William Towneley of Hapton Tower. He sort advice from another witch, who told him to go hunting on Halloween. He managed to catch a white doe, discovering when he returned home with it in the morning that it was in fact Lady Sybil. Later, after they had married, she was caught out again. A white cat was caught stealing from a neighbouring farm, the owner managed to cut off one of its paws before it fled. Come morning the paw was a hand and Lady Sybil was found abed missing a hand. The hand was reattached and supposedly healed well, leaving only a red scar. Tradition says she was buried at Eagle Crag and that every Halloween the hunt for the white doe is re-enacted by a ghostly cast. This tale was collected in the 1860s, by Harland and Wilkinson for their Lancashire Legends. They reported a simpler version previously, that only featured the hunting of a milk white doe on All Hallows Eve around Eagle Crag. In 1982,Terence Whitaker published an account of the ghost of a large, white, lop-eared rabbit which haunted the area around Crank and Rainford. Some say it disappeared once the railway was built. Whitaker details a long story that tells of a witch who was injured by men who thought she had wronged them. The men were seen by her grandaughter and her white rabbit and they chased her out of the village, killing the rabbit and leaving the girl to be found dead in the morning. The ghost of the rabbit then made itself known to the guilty men, and remained in the location thereafter. Dobby/Dobbie/Dobie are normally helpful household elfs in Northern folklore, but this is not always the case. Some Dobbies seem to be spirits associated with death, as in this case. The White Dobby was said to appear on stormy nights on the road between Bardsea and Rampside. It looked like a gaunt and weary pilgrim, and hurried along the road without speaking. Ahead of it ran a ghostly white hare with bloodshot eyes. The hare terrified any dog that encountered it. The one time it reportedly spoke was to the bell-ringer and sexton of Bardsea Church as she rang the passing bell. It was seen ever after when the passing bell was rung after dark. This account comes from Bowker’s Goblin Tales of Lancashire (1883), and featured in the ‘King of Cats’ exhibition that the City Museum hosted a few years ago. Categories: fantastic lancaster beasts, theme | Tags: fantastic lancaster beasts, Lancashire Folklore | Permalink. A day late – apologies, I somehow lost track of days of the week! Not all of the beasts we want the trail to be inspired by are from Lancashire Folklore, Lancaster has beasts with ties to the city that can be seen as you walk the streets already! Though some, like the Phoenix, are a little harder to see. Lions – there are a lot of Lions in Lancaster – from the city’s crest to the badge of the former regiment the King’s Own. There’s even the Golden Lion pub! 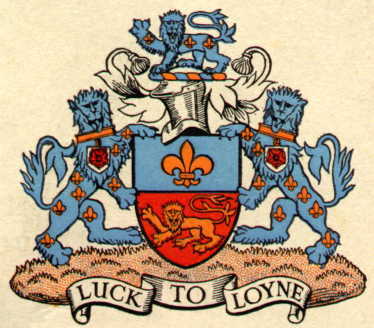 Older Lancaster crests always feature a lion, though the number varies. There’s the lamb, side by side on one of the bank buildings just off Market Square. The lamb is the lamb of god, not an unusual symbol in Lancashire (it’s the crest of Preston ;)). An Owl perches on Queen Victoria’s scultpure in Dalton Square, along with some more lions and a few cherubs. Not all of Lancaster’s beasts can be seen, but they are named! Phoenix Street – former base of Lancaster’s Phoenix Foundry.